I have not felt this eager about using a machine since my first Apple computer, the Macintosh Plus with 1 MB of RAM, when I was in college (yes, that long ago)! 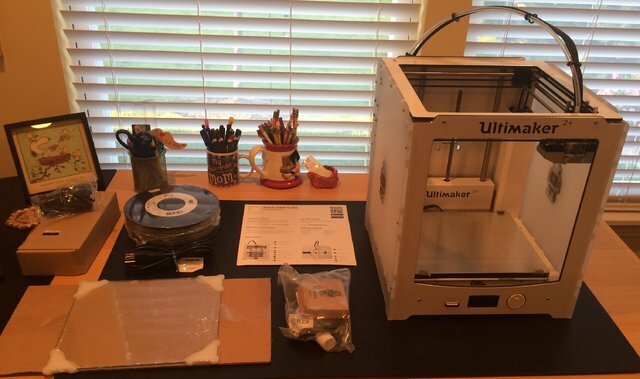 The Ultimaker 2+ arrived on a Monday morning in early August - which made the day even brighter. It’s not an exaggeration to say that the UPS guy was very excited to know what was inside the box. 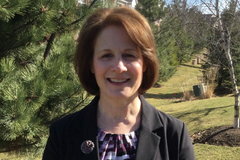 Throughout my life, I always preferred tackling problems and inventing new ones using a physical, hands-on approach. As a mathematics educator, whenever I could make a theorem or concept involving curves and surfaces (or really anything mathematical) come alive with a 2D or 3D model, or animation, I would jump to the task with programs such as Maple (my software of choice) or GeoGebra. I first learned about 3D printing in the college mathematics classroom when I was presenting at the International Conference on Technology in Collegiate Mathematics (ICTCM) in 2015. A colleague of mine who knew my interest in all things geometric, told me about the pre-session he attended and graciously gave me his materials and some really cool 3D printed objects from the session. 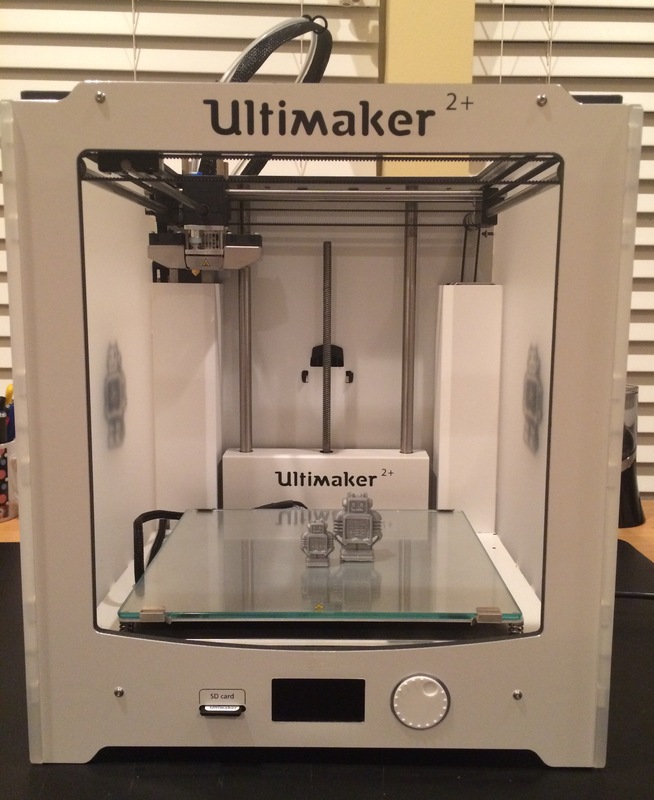 I had certainly heard of and seen footage of 3D printers in the news. But, this was truly a “Eureka” moment for me. Bringing 3D printing into my mathematical universe was that elusive step of the process I had been looking for! It would be the ultimate way to most realistically and creatively model the mathematics we were discovering in and out of the classroom. From that moment on, it was clear that I had to discover what there was to know about 3D printing. Becoming an Ultimaker Education Pioneer made exactly what I had envisioned come to fruition for me and my students. 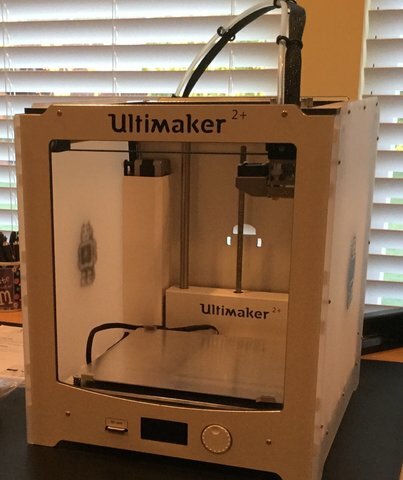 It has afforded me the opportunity to actually use a 3D printer in my Multivariable Calculus course this semester to spark the ingenuity and imagination of my students, to collaborate with educators from across the nation who have a wealth of knowledge to share about 3D printing in education and beyond, and it will enable me to grow without bounds in my own teaching and learning. Now back to the “pièce de résistance” . . . 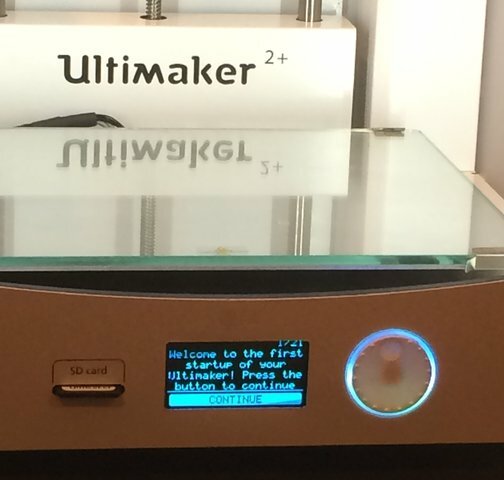 Setting up the Ultimaker 2+ was a breeze, thanks to the Quick Start Guide. Turning on the printer and seeing the welcome message was momentous! It comes with different nozzle sizes, too! 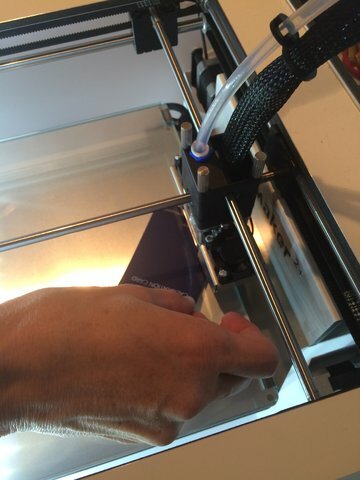 • Loading: When inserting the filament for the first time into the bottom of the feeder, don’t be afraid to apply pressure in order for the feeder to grab the filament (I was a bit hesitant to do so at first). 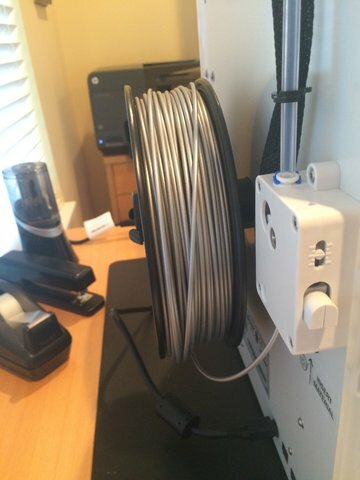 Make sure the filament starts to feed into the bowden tube, then continue to the next step. • Extrusion: Extrusion is different from loading the filament (sorry, I am a novice at this). After the feeder grabs the filament and you see it in the bowden tube, go on to the extrusion step. 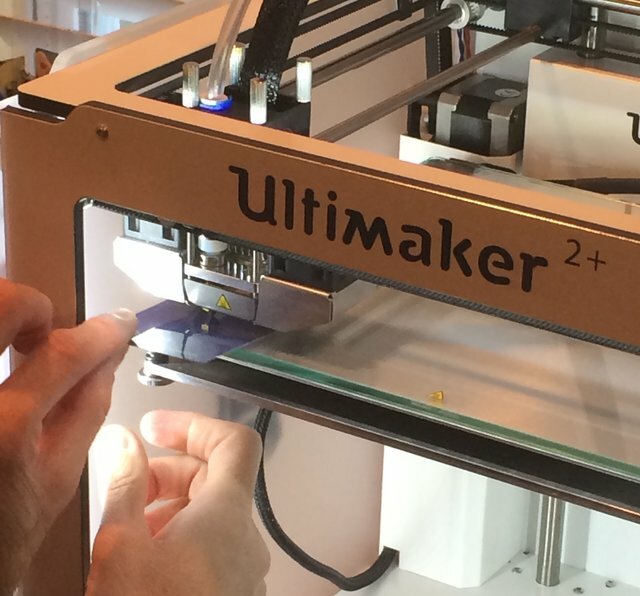 It is natural for some filament to be extruded in a small coil before the printer moves to print the Platform Adhesion. 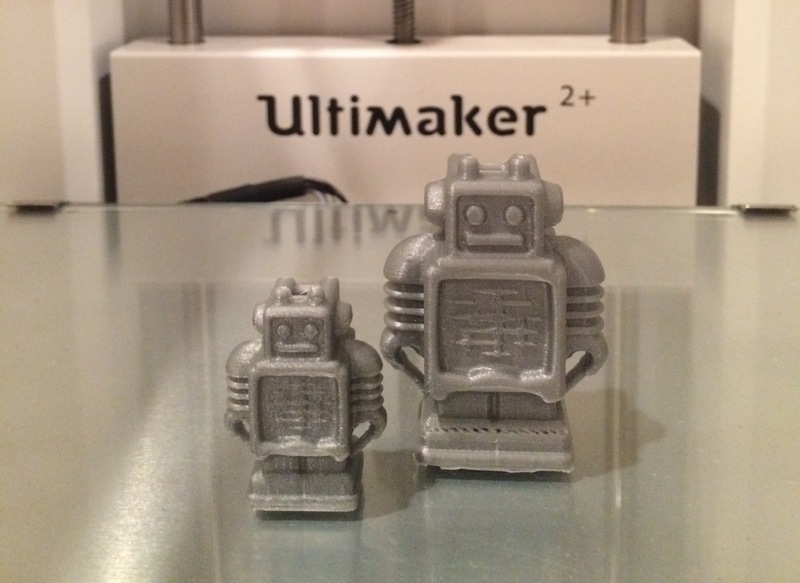 I chose the iconic Ultimaker Robot as my very first 3D print. I inserted the SD card into my Mac computer and opened the existing STL file for the robot in Cura (STL is a popular format widely used in 3D printing). 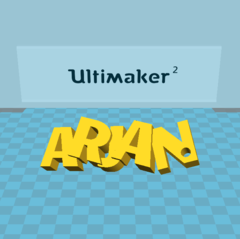 In Cura, I was able to see how the robot was rendered and I also wanted to become familiar with, and understand more about, the settings. I kept the settings as is for this first print. 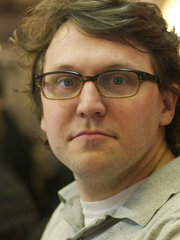 Slices of the robot were calculated in Cura and the GCODE file (which gives a list of instructions that the 3D printer understands) was produced and saved on the SD card. 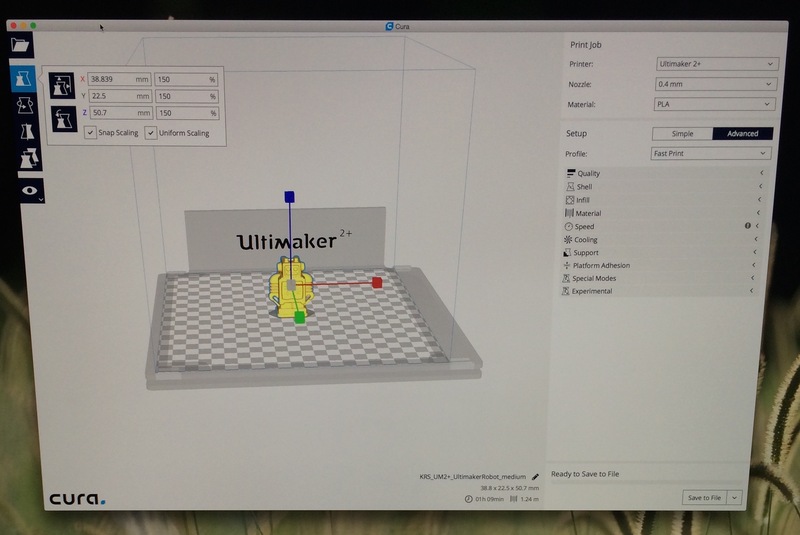 The SD card was inserted in the Ultimaker 2+ and I used the Print menu to navigate to the UltimakerRobot.gcode file to start the printing process. • In View Mode, it’s beneficial to see the slicing of Layers. When the object is rendered in this way you can also see the Type of Platform Adhesion: brim, raft, or skirt on the bed quite clearly. • Viewing the Layers in this way will be useful when printing more than one object at a time. There will be more on my experiences with the different types of platform adhesions and printing multiple objects in my next post. The moment we were all waiting for had finally arrived. My entire family (who had been keenly observing my every move with the printer up to this point) and I became mesmerized by what we saw next. It worked beautifully! My very first 3D print. I thought my robot looked lonely, so I used the Scale option in Cura to print a friend. This day will go down in history as the day I fell in love with the Ultimaker 2+ 3D printer. Since my first moments with the Ultimaker 2+, I have been busily getting more and more acquainted with the printer, Tinkercad, OpenSCAD, 123DCatch, and Thingiverse in preparation for creating lessons and introducing the 3D design and printing process to my mathematics major students. In my next blog post, I will share my experiences and some mathematical 3D print designs associated with modeling, scanning, and downloading that I have used in preparation for my course this semester. 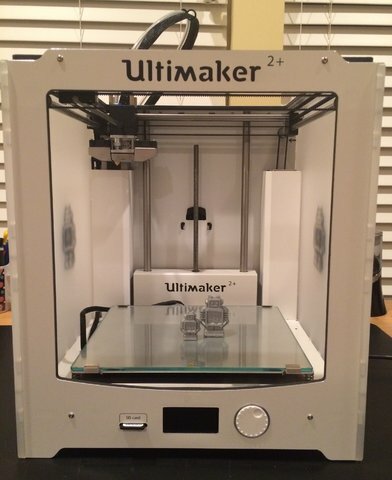 My students are looking forward to exploring Multivariable Calculus with the Ultimaker 2+! First; there's nothing wrong with a love for snoopy ... and welcome to the forum. The surface on the feet of your scaled up ultibot seems to be not closed... wonder what you did there as the rest seems good? And about this, you dont have to be afraid to break anything, the printer can handle a lot, but in this case, with the + feeder it's usually more helpful to straighten the end of the filament a bit as when it's really curvy it can be hard to get it in, just bend it a bit against the curve with your hands. 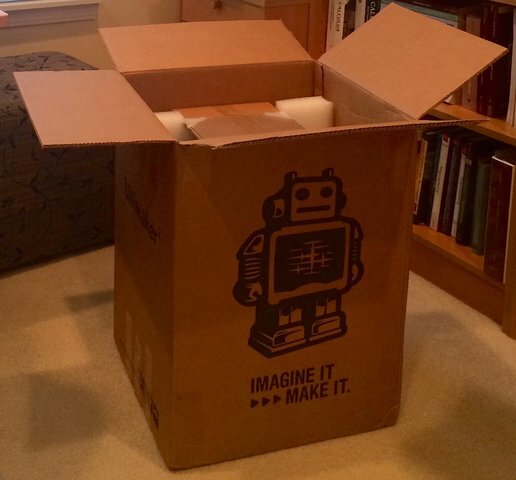 This is an excellent unboxing post -- thanks so much for sharing this! 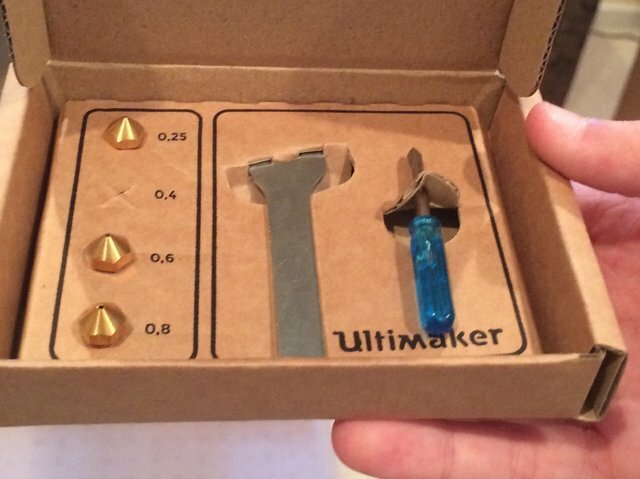 I second ultiarjan's note about straightening the tips of filament, especially when starting a new spool. For ABS and PLA, you can move a little away from the bits the curved around the catches on the side of the spool -- pick where the filament starts to straighten out more naturally -- and just score the filament with a knife, razorblade, or even scraper, and then the filament should snap cleanly. That is a fast and easy way to have just what you need to feed into the port. This is somewhat unhelpful for those starting out, but after flipping the machine around to load when you are first starting out, you can very easily load by feel from the front of the machine. You can tell with your fingers if the leading section of the filament is ready to go, and then press it gently up into the port during the loading sequence, tugging the filament below the filament drive a bit to make sure that it is well-gripped by the gear teeth. At which point you can activate the fast forwarding stage of loading with you already in position to watch those crucial first stages of moving into the hotend itself.